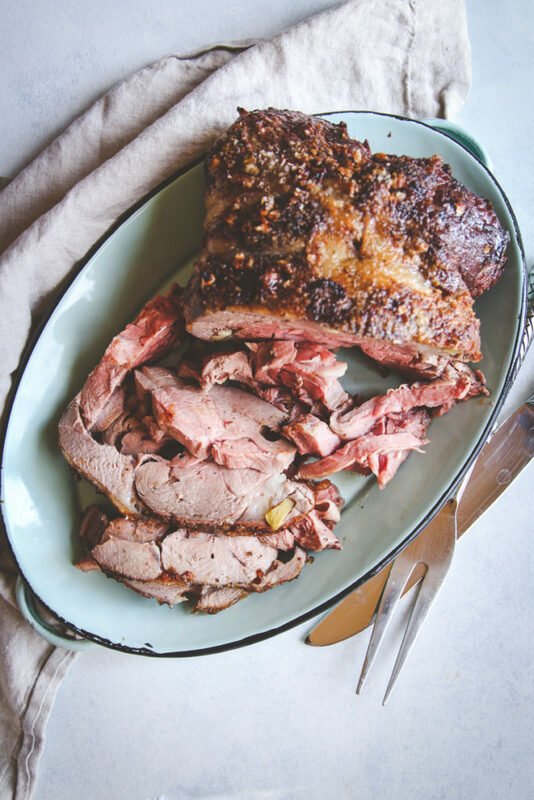 This garlic roasted leg of lamb is a delicious recipe that comes from a rich family history of preparing lamb for family meals and is perfect for any time you’re looking for the best leg of lamb recipe. It’s an especially popular food for Orthodox Easter and other Orthodox holidays. Have you ever seen the movie My Big Fat Greek Wedding? 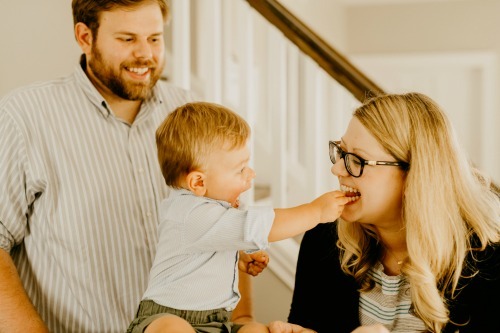 The romantic comedy is centered around a Greek-American woman (with a very involved family with lots of traditions) falling in love with a non-Greek man. Well, reverse the roles (me as the non-Greek) and that movie pretty much sums up half of my in-laws and what our wedding was like lol. My husbands’ mother and her whole side of the family are very Eastern European. Think lots of traditions and many trips to small ethnic grocery stores for holiday meals. When we got married a few years ago, my husband and I decided to have a traditional Serbian Orthodox wedding. We did the whole shebang-including wearing crowns as part of the ceremony. At one point during the wedding preparations my father (and I should really mention that I come from a European (German/Romanian) family as well with a lot of traditions of their own so it wasn’t completely foreign to me) made a joke about how the experience was like My Big Fat Greek Wedding. Of course I had to watch it again, and I laughed at the part where the main character is telling her family that her boyfriend doesn’t eat meat. That part always cracks me up, and definitely reminds me of my grandmother-in-law. 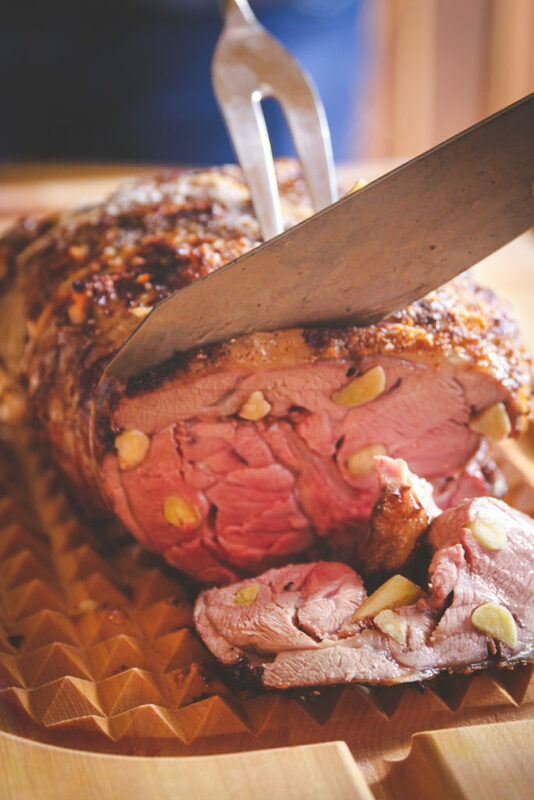 Lamb is a staple at family holidays and get togethers. And not just any lamb, but a leg of lamb made with lots of garlic. 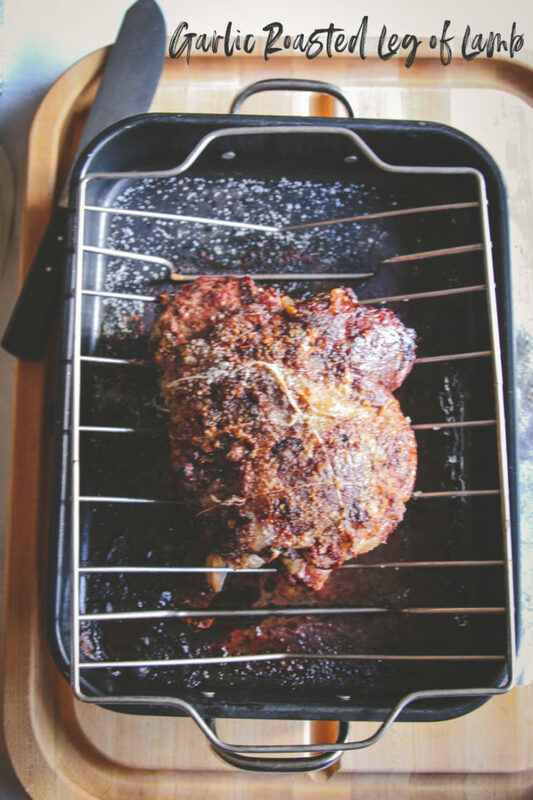 A garlic roasted leg of lamb. 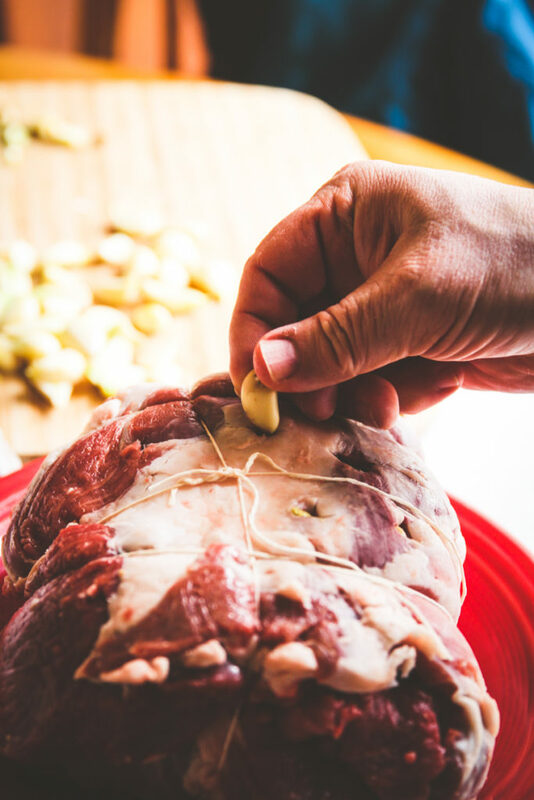 They key is cutting many little holes into the lamb and then pressing garlic clove pieces into the holes, and making sure to press garlic cloves ALL around the lamb. While the lamb is cooking, the garlic cooks into the meat as well, so you’re left with tender meat that has a nice subtle garlic flavor. I got nervous, but persevered. At dinner, she exclaimed that the lamb was “super.” I’m pretty sure my heart swelled and that that was one of my best cooking moments, EVER! Over the years I’ve made this garlic roasted leg of lamb a bunch of times, but the true hero of cooking meat is my father in law. He is such a good cook, a true kitchen genius. When I was discussing making a leg of lamb for the blog, he graciously volunteered to help and did everything from going to pick up the leg of lamb at a butcher (a lot of stores only carry leg of lamb the week of Easter so you have to call a few smaller butchers) to removing the bone beautifully (he even tied it perfectly). 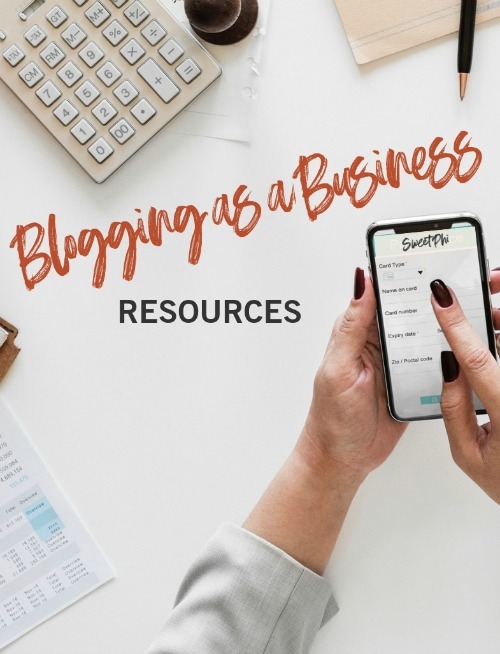 A big thank you to him for helping bring this post to life! 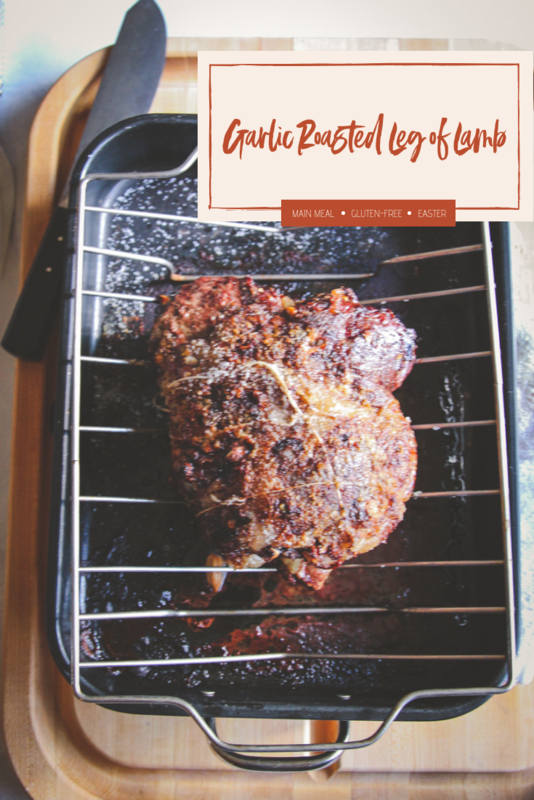 So today I’m sharing a recipe for garlic leg of lamb that you’re going to fall in love with. 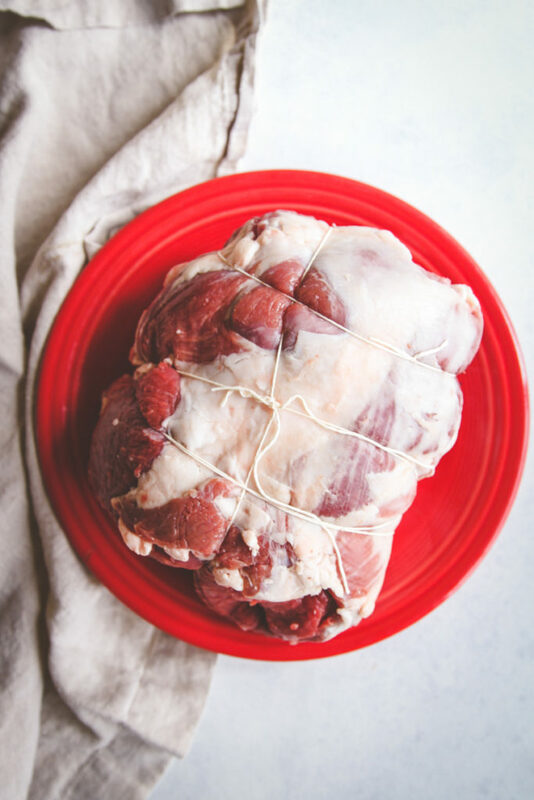 Pat leg of lamb dry with a paper towel. 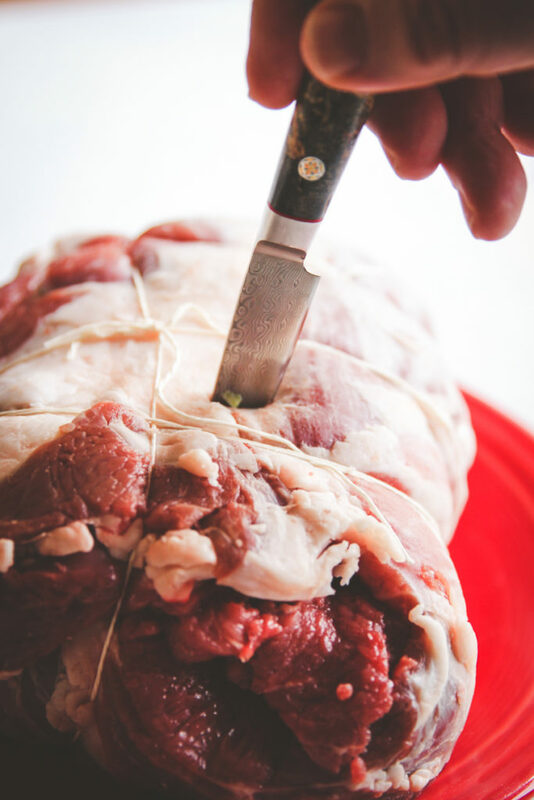 Using a sharp knife cut small Xs 1 inch apart all around lamb and insert garlic gloves into where you've made the small X with the knife. 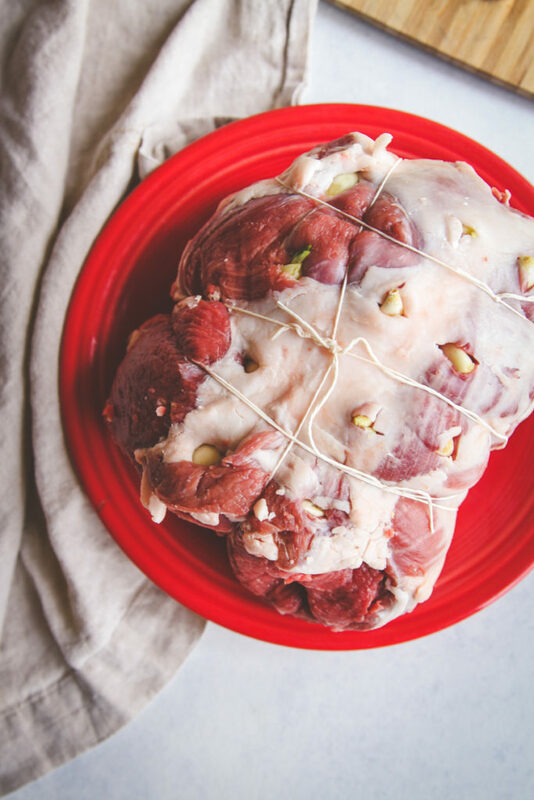 Place the leg of lamb into a roasting pan. 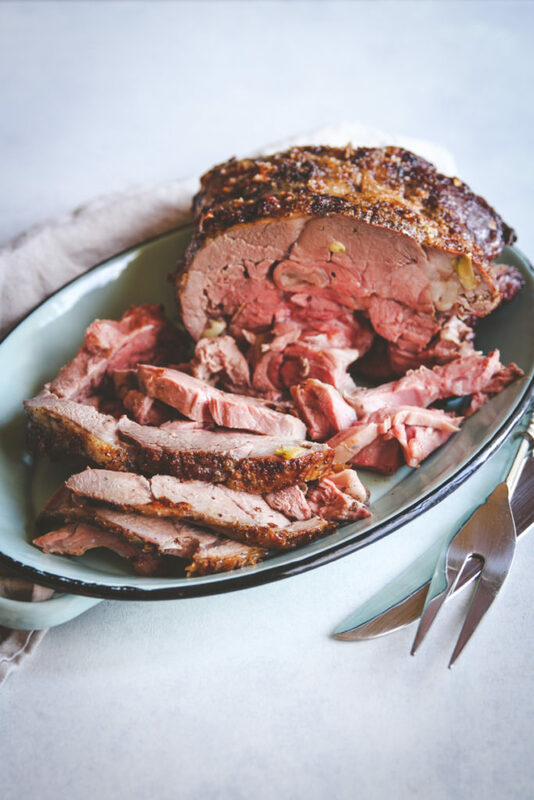 Drizzle olive oil over the leg of lamb (use your hands to rub it in), then sprinkle with salt and pepper, patting the salt and pepper onto the leg of lamb. Cook the leg of lamb at 275 for 3-3 1/2 hours. Check the internal temperature with a meat thermometer. You want an internal temperature of; Rare 130-135, Medium 135 - 140. 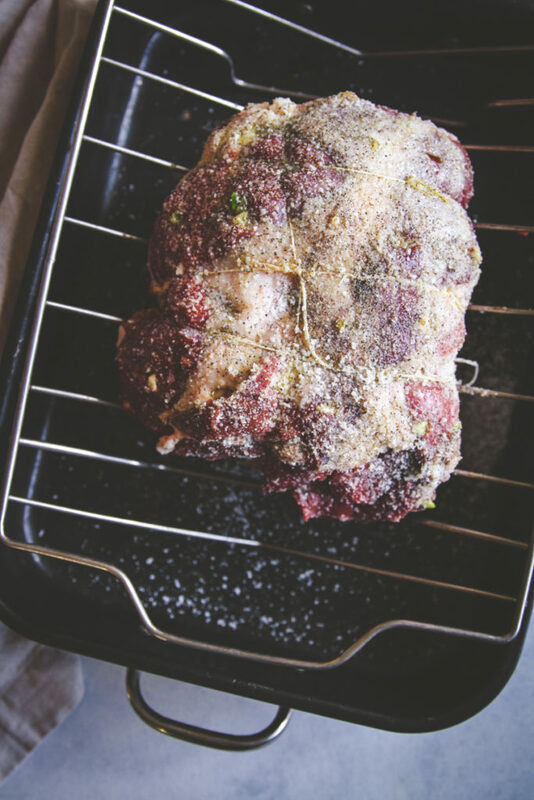 Remove from oven when the leg of lamb has reached your desired doneness temperature. Tent/cover with aluminum foil and let rest for 40 minutes. Preheat oven to 500. Remove the foil and roast the leg of lamb for 15 minutes until a nice brown appears. Remove from oven and let rest of 5 minutes, then slice and enjoy! 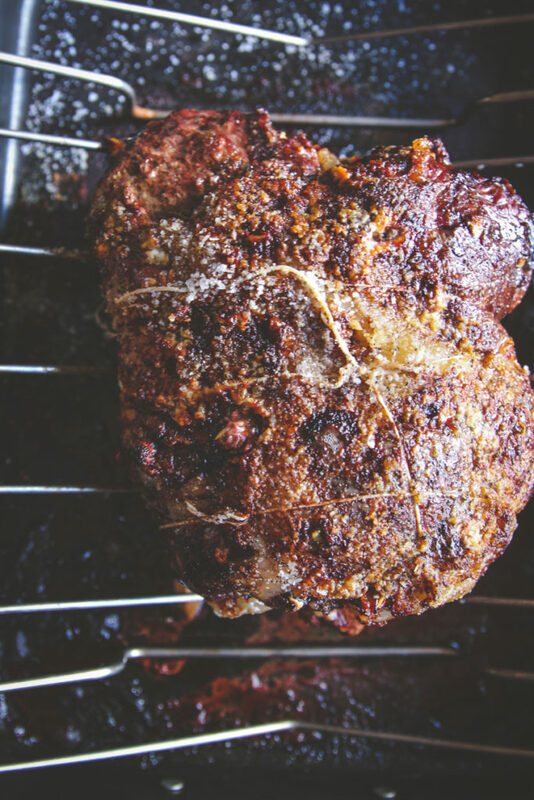 Roast at 275 for 3 – 3 ½ hours.